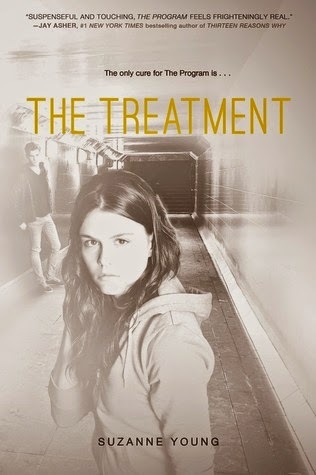 After reading and loving The Program, I couldn't wait to get my hands on the sequel The Treatment! Young has taken such a tragic and difficult topic and weaved it into a dystopian novel in a way that will both break your heart and fill you with hope at the same time. I loved Sloane and James in the first book, so I was heartsick for them, as we watched them enter The Program and are basically brainwashed to forget their memories and who they once were. Sloane and James, however, have found their way back to one another and while it hasn't been an easy journey, it does goes to show you that love can overcome the most challenging of obstacles. Pacing: The Treatment is a bit slower paced than The Program. It did pick up more towards the middle and sailed into the end. Sloane and James may be together again, but the danger is far from over. On the run from the Program and in possession of one orange pill that could change everything, the two end up joining up with a band of rebels to figure out their next move. Storyline: Being a duology, I had to wonder how Young was going to wrap everything up in the span of one book. Sloane and James want to be free of the Program and live a normal life without the fear of being sent back, or worse, erased completely. The pair face new challenges with the rebels, as well as the re-emergence of Michael Realm, who played a large role in Sloane's life in the first novel. The entire foundation of Sloane and James' world is fragile, not knowing who can be trusted and emotions run high in this novel as the ever-present threat of depression hangs heavy over all our characters' heads. Being in possession of the treatment is very dangerous for all involved, especially if it falls in the wrong hands. Characters: I love that Young shows us the strong and weak moments our characters have. There are moments where they don't know how to control their emotions and feel like they are being suffocated by their sadness and pain. It was hard to watch them feel that way, but I love that Sloane and James grounded one another. Their relationship is seriously tested in this novel- not just by Realm and his love for Sloane, but by knowledge of the past. Knowledge is power but it can also destroy. I like that Sloane decides to live for the here and now and not dwell on the past. She is afraid to take the orange pill Realm gave her, as there are so many unknowns about it. Maybe getting her memory back will be more painful than helpful, and she is already in such a fragile state of mind. Yet, when new information about her and James's relationship comes to light, she is forced to question their feelings for one another. We do have a bit of a love square in this one. One of the new characters introduced, Dallas, isn't afraid to show her interest in James. She is rough and tough around the edges, but deep down she's a vulnerable girl who is hurting. Her time in The Program was not a pleasant one and her relationship with Realm is complicated at best. Ah, Realm. I can't say I really like the guy. Mainly because I'm all for Sloane and James and he just seems to get in the way. I don't like the way he treats Dallas and after finding out more about how the two are connected, I really disliked him. I do believe he genuinely cares for her though, but he is so blinded by his affection for Sloane, that he doesn't think about his actions and their consequences. Final Thoughts: I was really happy with the conclusion of this series. We get closure on what happens with the Program, as well as with Sloane, James, and friends. I really loved the uniqueness of this duology and the emotions it evoked. It was difficult to read at times because of their struggle to move forward with life without their memories. I can't say I enjoyed this one more than the first, but I did feel satisfied upon finishing. I didn't enjoy this one as much as The Program either but as a series it's one I will remember. I love how unique it is and I look forward to seeing what SC comes up with next. And yea, I hate Realm too!